I have written many blog posts about being more mindful of what you put inside your body: from matcha, turmeric and reishi, to switching to warm foods for the winter and figuring out how to navigate gluten sensitivities. I hope you are all cooking up your own bone broths and experimenting with golden milk and matcha cocoas! But I wanted to touch on an aspect of clean eating that is not as talked about: cookware safety. No matter how nutritious, super-foody and green the ingredients you are buying, if you are heating them up in toxic pots and pans, you are putting yourself at serious risk. The main culprits for harmful cookware are non-stick pans: the chemical, polytetrafluoroethylene (PTFE), commercially known as Teflon, is what prevents food from sticking to a surface: it is extremely stable (it doesn’t react with other chemicals) and can provide an almost frictionless surface. Luckily, Teflon itself is not suspected of causing cancer. However, perfluorooctanoic acid (PFOA), also known as C8, is another synthetic chemical present in non-stick cookware, and this is the one to look out for: Although it is generally burned off in the process of making Teflon, it can stay in the environment and in the human body for long periods of time. According to the American Cancer Society, studies in lab animals have found that PFOA increases the risk of certain tumors in the liver, testicles, breasts and pancreas. While these studies were conducted on lab animals, it seems likely that exposure to PFOA is not having a beneficial effect on humans. In fact, studies performed on people exposed to PFOA who live near or work in chemical plants have found an increased risk of testicular cancer with the increased PFOA exposure. Dr. Andrew Weil assures us that the dangers of PFOA are mainly for people working in plants that manufacture the pans—not regular cookware users. “The non-stick coating itself appears safe unless it is heated to high temperatures [464 degrees], when it emits fumes toxic enough to poison fowl.” Since you generally don’t exceed 464 degrees when cooking, you are probably safe—but what if you leave a pan unattended on the stove? I certainly don’t want to take any risks if I can help it. So, outlined below are a few alternatives to non-stick pans—sturdier, safer, and honestly, more enduring—as well as brands/models to avoid. 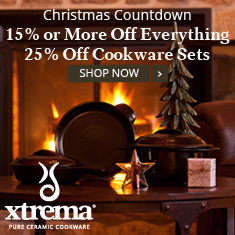 Xtrema: 100% natural ceramic cookware ensures that no unwanted flavors or chemicals are leaching into your food from the cooking surface. Their ceramic is made from clay, water, and various inorganic minerals such as Kaolinite, Mullite Petalite, Cordierite and refractory clay—all found within the earth’s crust. No metals or glues are used. The website states that “ceramic is naturally durable and non-reactive—it won’t change the taste of dishes.” You can also safely heat and freeze it. Best of all, it is a super easy clean-up! 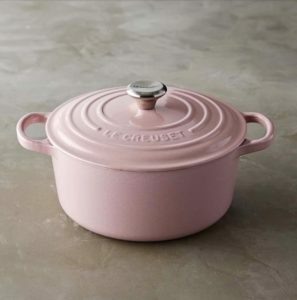 Le Creuset: While many of Le Creuset’s products can be pretty pricey, they are so worth it! (my personal favorite!) 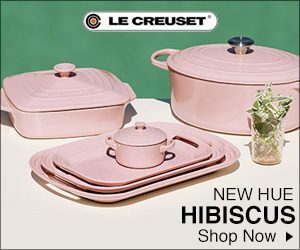 Their dutch ovens will literally last a lifetime, are pretty to look at, and so versatile. The traditional ones are cast iron with an enamel finish. They are safe on the stovetop and in the oven and the enamel actually prevents sticking—with no Teflon in sight! 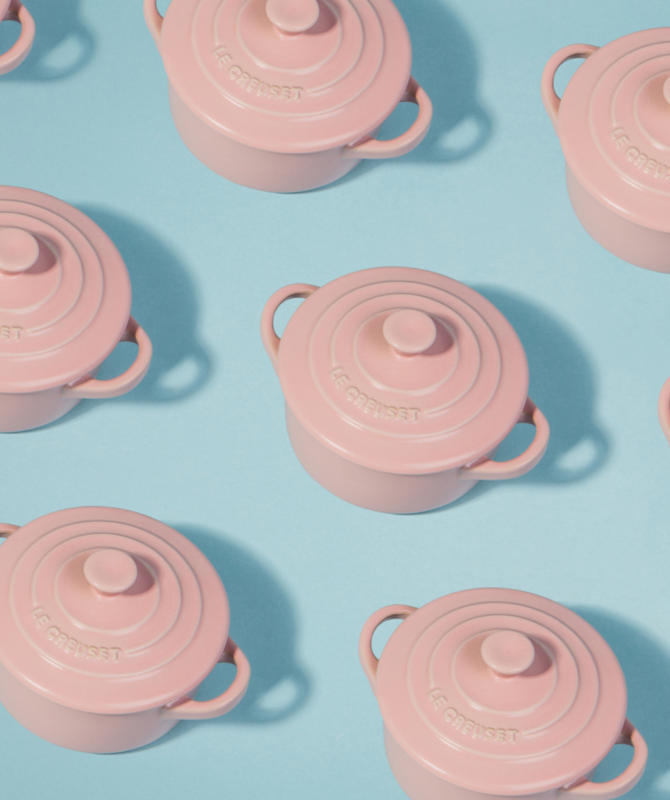 But they’ve diversified their products since those original, century-old enameled cast iron models, and now boast a PFOA-free non-stick line of pots and pans. All-Clad Stainless Steel: Crafted in a mill in Canonsburg, Pennsylvania, All-Clad uses American craftsmen and American metals to make their bonded cookware. It is not only steel that is used in these pots and pans, however: clad actually refers to layered cookware, which means that the stainless steel surrounds a sandwich of other metals, such as aluminum or copper, in order to conduct heat—but this metal base is covered completely with stainless steel, which is inert and provides the cooking surface, so your food will not have any contact with that metal base. Aluminum Cookware: You can find this in practically any kitchen and home goods store you go into, from Target to Williams Sonoma. Aluminum is an excellent heat conductor, so it has been popular in cookware. However, it is also extremely reactive with acidic foods, such as tomatoes, vinegar and citrus. A Cook’s Illustrated test found that cooking tomatoes in aluminum pans caused an unpleasant metallic taste and smell and left the pan with a pitted surface—indicating that the aluminum had been leached from the pan into the tomatoes. Calphalon: While Calphalon does not use PFOA in their nonstick pans, and the FDA has approved their nonstick cookware, I recommend staying away because of their use of PTFE and anodized aluminum (anodizing is a process of highly controlled oxidization, which increases the corrosion resistance of a metal). Like clean cosmetics, clothing and sunscreen, switching to clean cookware may take a little bit of extra thought and care: that super discounted non-stick pan at Target? It’s probably not the best choice. But I guarantee it’s worth it to take the time to do the research, select the right cookware for you, and, if not save the world, take steps to make it–and your body!–cleaner. This entry was posted in Dwell, Lifestyle and tagged All-Clad Stainless Steel, Aluminum Cookware:, Calphalon, cookware, kitchen, Le Creuset, Non-Toxic Cookware, pans, pots, Xtrema.